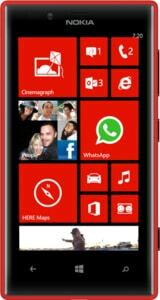 The Nokia Lumia 720 is designed to be an affordable Windows Phone 8 smartphone, starting at around €249. The handset features a slimline unibody design, colourful cover options, a 4.3-inch 800 by 480 display and a Qualcomm Snapdragon S4 processor, as well as NFC. A “super sensitive” touch screen works even with gloves or long fingernails, Nokia says. Wireless charging is also available via an optional shell for the device. The Nokia Lumia 520, a budget WP8 device announced alongside the Lumia 720 on 25 February 2013 at the Mobile World Congress, does not have NFC.